While browsing for children's books at Borders bookstore in Kuala Lumpur last Friday, I chanced upon Kumon Activity Book for small kids. It's called Kumon First Steps Workbook. 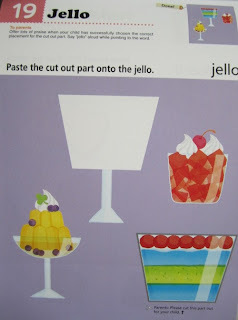 There are a few First Steps Workbook for kids age 2 and up but I was more interested in "Let's Cut Paper" and "Let's Sticker and Paste" as my son (who is actually 3 years +) is discovering cutting and pasting skills. He can sit for hours cutting paper and he's really proud of his "end product" though mummy will then have to clean up the mess. "Let's Cut Paper! Amazing Animals" consists of 39 colorful pages of animals that your kid can cut around, straight lines, zig zags, curved and spiral around cute animals like alligator, bat, whales and such. I am not too sure of your child but my 2 year old definitely is too young to handle scissors on his own, this workbook is more suitable to 3.5 years old in my opinion. Page 22 of Let's Cut Paper! "Let's Sticker and Paste! Food Fun" consists of 8 pages of sticker activity and 31 pages of cut and paste sticker activity (the cut out can be quite small and parents have to cut it out for the kids), the food pictures consists of desserts like sundaes and cupcakes and also a lot of colorful fruits and vegetables so that the kids can also learn the different types of fruits and food at the same time. This workbook entertained both my 3 years + and my 2 year old for a good 30 minutes. Kids Activity Book: Page 29 of Let's Sticker and Paste! Kids Activity Book: Page 30 of Let's Sticker and Paste! A great way to spend some bonding time with the kids without turning on the television. My first son was so proud of his achievement that he kissed me on both of my cheeks after completing 8 pages of the "Lets Cut Paper!" Kumon workbook. I'm no Kumon expert but this workbook receives my seal of approval for both the beautiful pictures and easy activity.